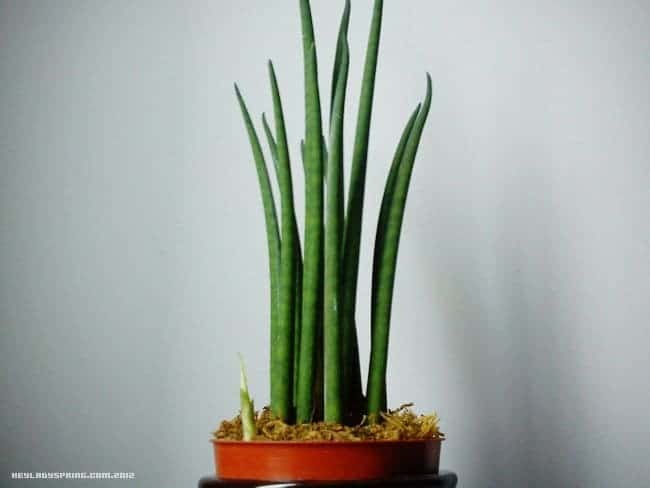 These are two popular plants that get talked about all the time! However, both species have tons of common names. Which Mother is which? What’s the difference? Where can I get them?? Read on to find out everything you need to know about these two kool Kalanchoe. What are the main differences between Mother of Thousands and Millions? Where can I get these plants? 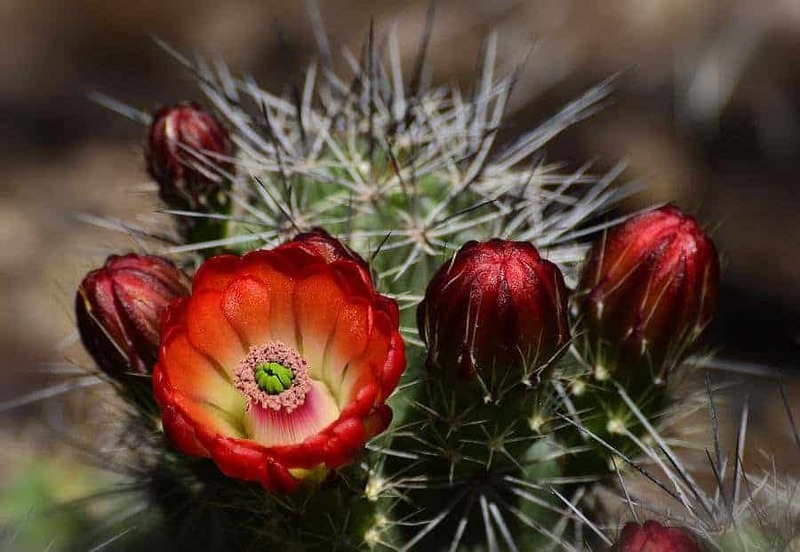 People often confuse these plants, either because they don’t know to use the correct name, or because they don’t know that they are two different plants! That’s why we have scientific names. They are supposed to clear up confusion created by people calling the same plant different names. Unfortunately, in this instance, the scientific names of these plants are also in flux! 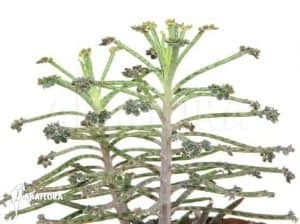 The plants were previously part of the Kalanchoe genus, but have been reorganized into the Bryophyllum genus. This causes even more confusion! So we made a list of the names of the two “Mother” plants you are likely to encounter. Now that you’ve got an idea of which plant is which, you can read on for some information about the two! The biggest difference is the shape of their leaves. 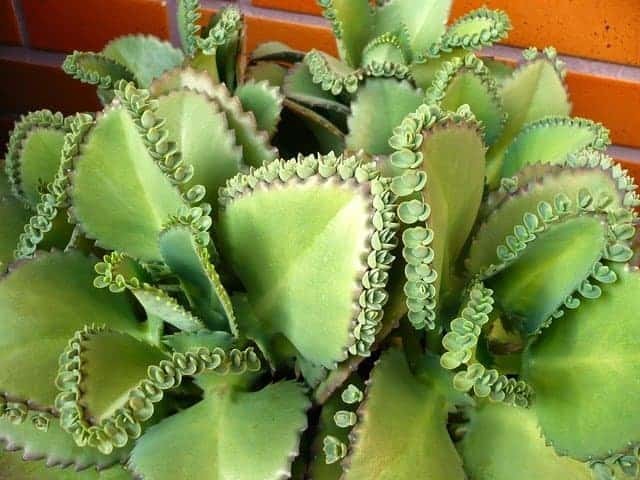 Mother of Thousands has broad, tear-shaped leaves. You’ll notice that they always grow in pairs, each leaf on opposite sides of the stem. The next pair of leaves rotates 90 degrees, so that the new leaves don’t block the sun from the old ones! This alternate leaf pattern is common in plants, and helps ensure all the leaves get sunlight. If you look at the edges of the leaves, you’ll see they have little ridges. That is where the baby plantlets form! These plantlets, or buds, grow all along the edge of the leaf. A happy, healthy leaf will have a full complement of babies around the edge of it. Leaves also rush to grow babies if they are damaged or think they’re about to die. Mother of Millions, on the other hand, has very narrow leaves. You’ll notice that it has 4 leaves that all grow from the same place on the stem (the node). These don’t alternate like the Mother of Thousands. The plantlets on these leaves only grow at the end of the leaf, near the tip. Usually there are between 2-4 babies on each leaf. Mother of Millions is considered a noxious weed in parts of Australia and Africa because of its rapid growth and spreading, in even the most adverse conditions. The final difference in these two Mothers are the behaviors of their growth. Mother of Thousands usually has a central, single stalk that grows up towards sunlight. It will often fall over due to the weight of its heavy leaves, and continue growing. 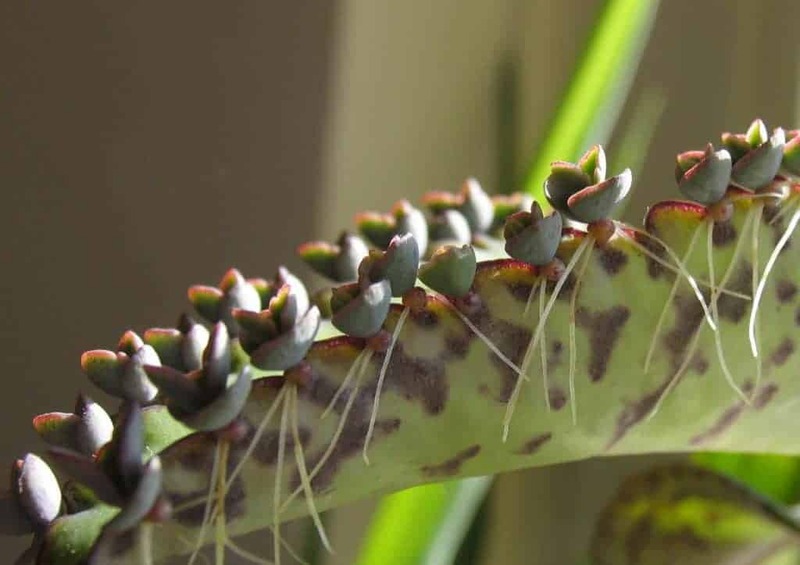 Mother of Millions often has several stalks rising from the same plant. While they primarily grow upwards, they can form bush-like patches. Since they are in the same genus, they are very closely related. They are both from Madagascar, and as such, enjoy the same treatment as most succulents in regards to sun, water, and soil. They thrive in bright direct sunlight, though they can also do pretty well in indirect light. These two Mothers appreciate the same watering schedule that most succulents do (infrequent, heavy waterings). In the soil department, they want loose, fast draining soil. Despite all their preferences, these plants seem to thrive on neglect. I’ve spotted them growing in sidewalk cracks in Charleston, South Carolina. They’ve sprouted up in a dark corner after falling from their mother. I’ve seen them thrive in places that are perpetually wet, a feat unheard of in the succulent realm. It follows that Mother of Thousands and Mother of Millions are considered by some to be weeds. While “weed” is a subjective term for a plant people don’t want around, these two plants sure do act like weeds. Their method of propagation is extremely efficient, so much so that it has a tendency to overtake other plants and crowd them out. The plantlets that form on their leaves are literally miniature plants. They are already growing and photosynthesizing while attached to their mother. Most even produce roots in addition to their leaves. By the time they hit the ground, they’re already a plant! That’s a huge advantage on those lame, regular plants that have to grow from seeds. They do produce seeds, although you’ll probably never see them. Their flowers are quite pretty, often orange or red, and sprout from a central stalk. The Mother plants don’t flower too often though. It’s easier and more efficient to propagate via buds! Both Mother of Thousands and Mother of Millions are poisonous, unfortunately. The milky sap secreted when the stem is broken carries a toxin that is dangerous to pets and children. In fact, Australian cattle frequently die from grazing on Mother of Millions, so the plant has a very bad reputation there. They are aesthetic house plants elsewhere, but you have to be vigilant that they do not spread to other pots or outside your home. Just about anywhere. If you spot one in a public place, you could snag a couple plantlets off a leaftip (ask for permission though). All dedicated succulent owners have come across the Mother of Thousands and Mother of Millions. If they kept one, they certainly have plenty of babies or saplings to give away. Check succulent Facebook pages that swap plants and succulents in your area. They are easy to grow succulents, and much loved by beginners. You can also buy them online, though they are sometimes hard to find because they are considered weeds in some places. Here is an example of a Mother of Thousands from Amazon. You can click it to be taken to the store page. Search for other plants on Amazon here. Check also at your local home improvement stores in the succulent section, as these show up from time to time (although always mislabeled). Is there any other information you want to know on Mother of Thousands or Mother of Millions? Tell us below in the comments! 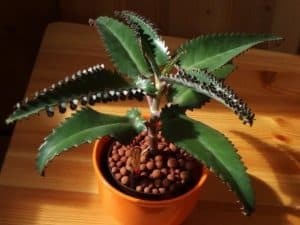 I have a different looking plant with thick leaves that are opposite, with leaves shaped like Mother of thousands but not cupped, lighter in color and on the blue/green side. Has a new plant coming off the end of two of the leaves. I am assuming it is also a different kind of Mother of thousands. Can you tell from my discription? I also has grayed purple elongated spot. Not an answer but another question. I purchased a Mother of Thousands from a nursery 3 weeks ago. It was very healthy looking but they had it in a dark room to keep it from “interfering” with the other plants. It did not have any babies. To date it has not started producing babies. In my experience, they don’t all produce babies at the same time. Some do it while they are babies themselves! Others have gotten more than a foot tall before they even thought about it. Don’t worry too much. It’ll happen eventually, then never stop. Try stressing it out if you want to induce propagation quickly. More sun, less water, etc. Plenty of some light will encourage the plant to produce babies. I have hundreds of them and the babies keep coming. My main plant is over a year old and just started loosing leaves but I have many more growing quickly in the sun. I have several of these in large pots mixed with silver dollar plants. I didn’t even realize they were both native to Madagascar! I’ve seen these plants in the ‘wild’ in Florida, and suspect they were on someone’s deck and they spread. I live in Iowa, so mine overwinter inside, they do NOT like anything below freezing. Mine develops babies in the heat of the summer and then stop again once the temps dip into the high 40s at night. they do not usually have any on their leaves during the winter, though they are in decent sunlight. One question I do have about these gals – why do the top 3 or 4 sets of leaves curl up, sometimes so much they loop back to the stem? Thanks for sharing your experiences with them! I’m not sure exactly why they loop – but they totally do. I’ve noticed that when they lack light, the leaves point up and out, like they’re reaching for it. When they have plenty, the leaves curl down and become quite dense, especially on the lower parts of the stem. How long does the plant flower, and how long does the flower last? Do all of the plants flower? Yes, all Kalanchoe plants will flower. These two don’t do it very often, and the flowers only last a couple weeks. 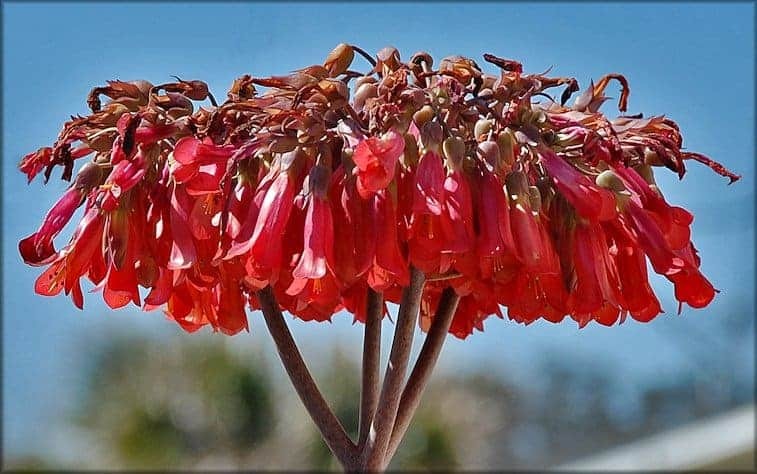 Maybe try looking for a Kalanchoe blossifeldania – they flower all the time and are commonly sold at grocery stores. Is it recommended to ‘thin out’ the pots due to the constant addition of other ‘babies’? If they are so toxic, what does one do when you have an abundance of ‘babies’ and want to be rid of the surplus? If the plant is in a pot outside of a private yard, and the ‘babies’ drop outside of the pot, will they be harmful to any ‘critter’ if they happen to eat one or must they consume many? I just purchased a plant tagged an ‘alligator plant’ at a plant sale and do not know anything about it. But from reading about it on this site, not sure it was a good purchase. I bought it for a friend who has ‘two black thumbs’ and figured a succulent would be good for her here in Texas. What do you suggest?